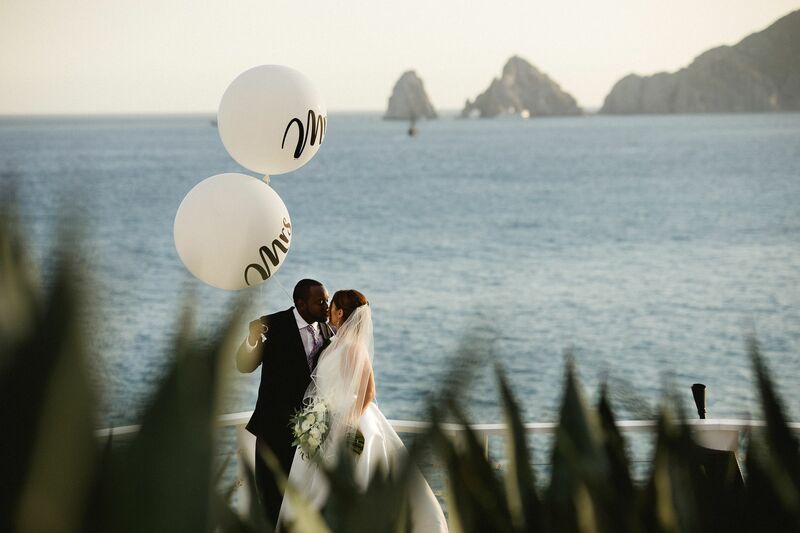 Cabo’s warmer than warm summer temperatures and resplendent sunshine were no deterrent for Maya and Brandon, who brought over 70 of their nearest and dearest to sunny Los Cabos to celebrate their nuptials this past August. The Hilton Los Cabos’ swimmable beach and crystal clear pools provided the perfect escape from the heat, as guests checked in for the much-anticipated wedding weekend ahead. After a casual, Friday night gathering to welcome friends and family, Maya’s day had arrived, and the Hilton’s more than generously sized suites proved the perfect location for our bride’s getting-ready sesh! The power duo behind Pink Palm Photography was on-site early to capture the details, as Maya´s doting mother and sister, as well as beauty genius Alma Vallejo, ensured she was well looked after. Sunset MonaLisa restaurant, a Los Cabos landmark, was the location of choice for both the formalities and festivities and its awe-inspiring views had arriving guests snapping early pics pre-ceremony. Overlooking Misiones Beach, Maya and Brandon opted for a staggered ceremony setup on Occidente Terrace, a far cry from traditional but certainly striking. 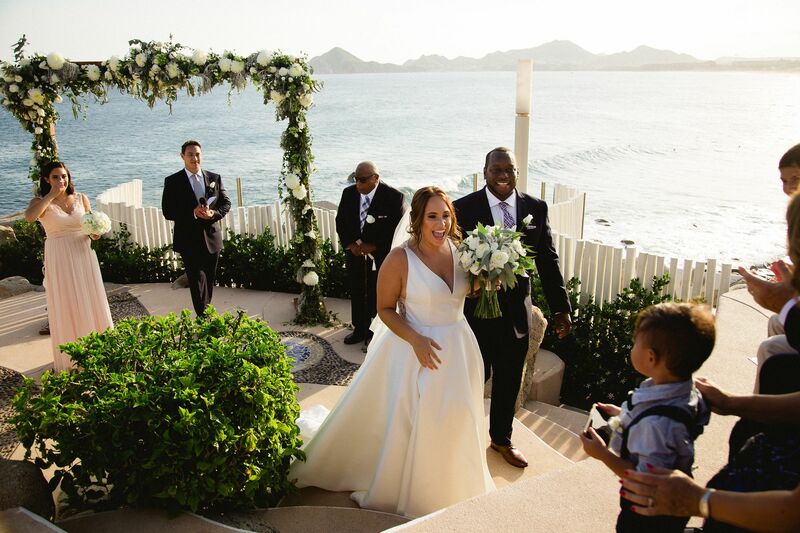 Maya chose to keep her decor simple, opting for a statement arch of natural foliage, white roses, chrysanthemums and lisianthus, which perfectly framed the couple against the overwhelming backdrop of Land’s End and the glimmering Sea of Cortez. Maya’s full skirt, structured bodice, and elegant train completed her classic look, not to mentioned her to die for shoes by famous designer Badgley Mischka, and Brandon was equally impressive in his formal attire. Maya’s classic theme rolled over into her gorgeous reception space, where generous touches of rich gold accented a traditional white and cream palette. A myriad of square crystal vases provided the perfect contrast to traditional round tables, and Emporio Arte Floral ensured soft white roses and ample candlelight completed the bride’s romantic vision. Small touches, such as hand-painted table numbers and tiny tequila gift bottles were the icing on the cake! With the sun retired for the evening, city lights twinkling on the horizon and the lavish 4-course meal packed away, guests were itching to dance. To open the party Maya and Brandon cut their delicious, 3 tiered cake (thank you Cabo Cakes!) and DJ Alex turned up the volume, mixing modern tracks with some old school hip-hop. Jackets and high heels came off and the shots came out, as barely a bathroom break could keep this group off the dancefloor! From Cabo Wedding Services, a heartfelt thank you to our team of wonderful professionals, who worked tirelessly despite the heat to ensure Maya and Brandon’s special day went off without a hitch. Maya and Brandon – we wish you a very long life full of love and happiness. Through my experience I have perfected the art of planning and coordinating every step of your special day and have passed my talent and expertise onto my team. But First, Please leave a Message in the Bottle! Gwen & Kurt- A Fairytale Wedding for an AMAZING Couple! What You NEED to Know About the “First Look” on your Wedding Day!